Published in the North Island Gazette November 4, 2015. Mungo Martin was a master carver and prodigious defender and recorder of the Kwakwaka'wakw culture in the early part of the twentieth century. He may be best remembered for his work to preserve his culture, bringing it to a new and broader audience, at a time when many were concerned the old arts were dying out. Mungo Martin, also known as Nakapenkem (which in Kwak'wala means 'a potlatch chief ten times over') or Datsa (grandfather) was born at Fort Rupert (Tsakis) in 1879. Martin's father, Yaxnukwelas, was a high raking chief from Kwikwasut'inuxw (Guilford Island), and his mother, Q'omiga (Sarah Finlay), was the daughter of a Hudson's Bay Company employee and a Kwakiutl woman. When Martin was born his parents performed rituals in order to help him to be artistic and musical. At the time, these types of rituals were common when babies were born. From a young age Martin was an active participant in the Kwakwaka'wakw culture at Tsakis. He was said to have taken a keen interest in cultural practices even as a child. When a teenager, Martin's father died. His mother married again, and Martin's new step-father was Yakuglas (Charlie James), who was a skilled carver. As a young man Martin spent time commercial fishing. He also trained under his step-father. One of his first commissioned totem poles, called "Raven of the Sea" was raised in Alert Bay around the year 1900. He married Abayah Martin, who was a talented weaver. In the early 1900s the skill of carving was becoming somewhat of a lost art, as the implications of the Canadian laws restricting First Nations potlatching and other cultural ceremonies took their toll. Museums began to attempt to collect and preserve the remaining examples of totem poles, house posts, and ceremonial regalia, many of which were decaying outside in the west coast weather. The University of BC hired Martin to work on restoring and recreating a number of poles which it had in its collection in 1949. On May 16, 1951 Martin participated in an unveiling of a collection of First Nation totems and house poles at Totem Park on Marine Drive in Vancouver. He spoke about the importance of preserving the historic Kwakiutl culture. Martin was then hired by Wilson Duff of the Royal BC Museum to create replica poles of the collection of totem poles in Thunderbird Park in Victoria in about 1952. He initiated the work, which was also carried on by Henry Hunt, Richard Hunt, and Tim Paul. One of the unique things about the Royal BC Museum work was that it was all carried out in a carving shed on the museum grounds. Along with totem poles and other ceremonial items, Mungo Martin built Wawadiťła (the Mungo Martin House) on the museum grounds in 1953. While built in the traditional style, the house is a living link to Kwakwaka'wakw culture, and is still used for cultural purposes to this day by Martin's descendants. The house was modelled after Chief Nakap’ankam’s house at Tsakis. 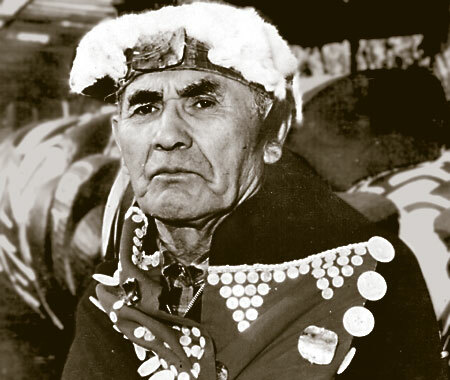 Martin was also a singer, and was recorded singing a number of traditional Kwakwaka'wakw songs. 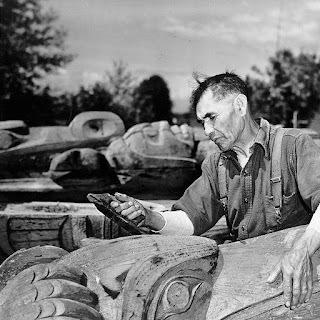 In 1958 Martin designed and was the lead carver on a totem pole presented to the Queen of England in celebration of the 100th anniversary of British Columbia. The totem was erected in Windsor Great Park in England. Martin died in 1962 in Victoria. His body was transported by a Canadian Navy ship to Alert Bay, where he was buried. A movie about Mungo Martin's carving, from 1963, is available here: https://www.youtube.com/watch?v=wMWIcxkTMu8.